Superintendents continue to look at practical places to lessen labor and inputs. Because Sarasota’s TPC Prestancia is located within a residential community, its course maintenance staff can’t reduce turf as much as it would prefer, as homeowners would rather have maintained turf (there are homes on 30 of the club’s 36 holes). 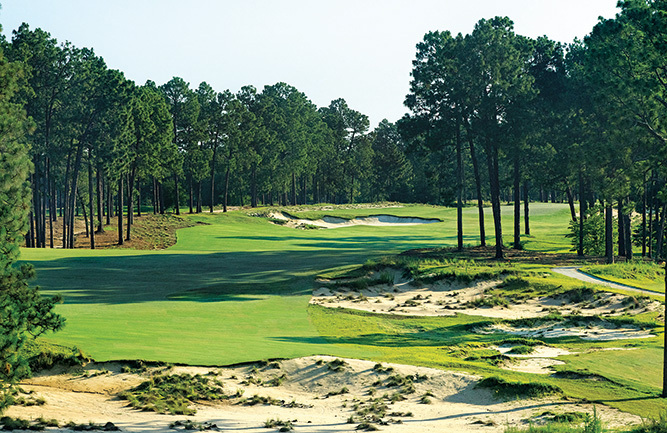 Nonetheless, staff members have begun to reduce the 585-acre club’s turf, mainly around trees and ornamental beds, prior to replacing it with crushed shells. To limit inputs and labor, Lee Johnson’s maintenance staff at Sioux Creek GC, Chetek, Wis., began to decrease rough areas more than 10 years ago, primarily by not mowing areas that were considered “out of the way” (with regard to distance from fairways), reducing mowing in general and raising the height of cut. However, slow play has forced the staff to mow some of these rough areas once again, particularly in recent months. Meanwhile, staff members at other courses, like Lawton Municipal Golf Course in Lawton, Okla., have considered downsizing some greens as well, but have yet to devise a proper plan to do so. To reduce weekly mowing, Ohio’s Delphos CC converted some of its out-of-play areas to natural areas about 15 years ago. However, as is the case at other courses, staff members have not decreased turf areas at all since then, with the primary reason being that there aren’t any other large areas that can be converted. In addition to not having enough large areas that can be converted, some courses simply aren’t interested in reducing turf, as they would prefer to expand their properties. To read other articles included in the 2018 State of the Industry Report, click here.